This hillside has been the site of a number of commemorative projects. In 1929, Father Alphonse Jan, OMI, had plans for a National Park to honour the Oblate Priests and Brothers. Although national status was not achieved, a tree-lined memorial drive was completed to remember both the Oblates and those who served in the military. A statue of Father Lacombe was also erected (across the road behind you). The drive is now gone but, in 1988, another project was initiated. Founders’ Promenade was a walkway lined with white spruce trees. Each tree was sponsored by one of St. Albert’s founding families with a named plaque placed beneath it. The walk is now a part of the current Founders’ Walk, running up the east side of the hill. La colline a été le site de plusieurs projets commémoratifs. En 1929, le Père Alphonse Jan, OMI, rêvait d’un Parc National pour honorer les Pères et les Frères Oblats. Bien que le rang national n’ait pas été atteint, une route commémorative dotée d’arbres servait à honorer les Oblats et les militaires. Une statue du Père Lacombe a aussi été érigée (de l’autre côté de la rue derrière vous). La route commémorative n’existe plus aujourd’hui, mais en 1988, un autre projet a été initié. Des épinettes commanditées par des familles fondatrices de St-Albert longent la promenade des fondateurs. Sous chaque arbre se trouve une plaque indiquant leur nom de famille. Ce chemin fait maintenant partie du Founders’ Walk, sur le montant-est de la colline. êwako ôma ispacinâs mihcêt kîkwaya ita êkîhitâkamikâki. êkospî 1929, Father Alphonse Jan, OMI, kîhitasiwêw kâhayâk êkota National Park kakisteyihtâkosicik Oblate ayamihêwiyiniwak êkwa ayamihâwak. âta namoya êhohcihispayik, êkota mîtosak êpimitamocik mêskanâsihk kakiskisihk nânapô Oblates êkwa aniki kâkîwîcîwêcik kâkîhitâkamikanihk. ayisiyinihkân ohci Father Lacombe kîcimahewak (akâmâyihk nâway ita kâhayâyan). namôya êkwa êkota astêw êwako mêskanâs mâka, êkospî 1988, kotak kîkway kîmâcipitamwak. 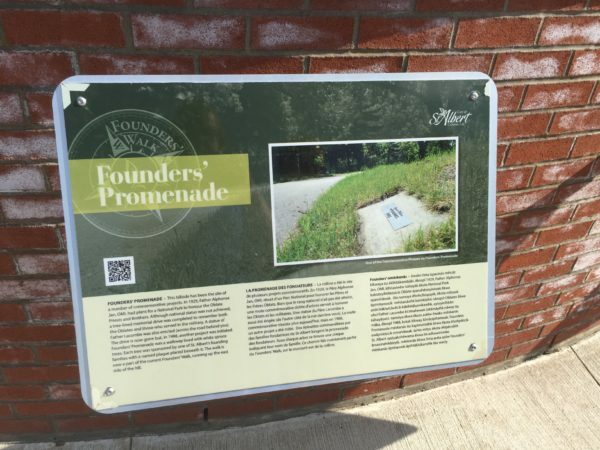 Founders Promenade mêskanâs ita kapimohtêhk êkwa êkota êhohpikicik ewâpiskisicik minahikwak. tahto mîtos êkota êkîpêmêkit St. Albert opêyakohêwama êkwa ita wîhowiniwâw êmasinahikâteyik. mêskanâs êkwa ôma anita ayâw Founders’ mêskanâs êpimamok âpihtâkîsikanohk ôta waciy.